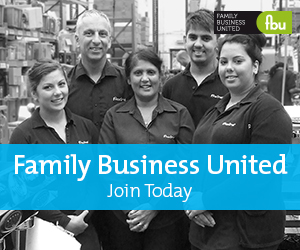 Family Business United was created by Paul Andrews who has been working in the family business field for over 20 years and is passionate about the sector. Our aim is simple, to champion the family business sector, recognise the contribution they make to the global economy and to provide a forum that brings the family business community together. Over the years Paul's experience comes from working in advisory firms such as Grant Thornton, Ernst & Young and Coutts & Co as well as running events for family firms and advisers, and working in and with family businesses across the UK. In addition, Paul worked for over a year as the Membership Director at the Institute for Family Business and was involved with the FBN Summit in London in 2012 too. Paul has also advised a number of professional advisory firms on how to deliver their offering to family firms and works closely with a number of family business clients to help them in their marketing, business development and social media activity as well. We have links with leading advisers and academics around the world to ensure we have access to the best articles available too. Based on this experience and our growing network of contributors, Family Business United is well placed to bring together the best content from around the world, using our extensive network to source research, insights, articles and more besides with the broader family business community. We love what we do and strive to improve our content and reach daily and make extensive use of social media in doing so. If you are intereseted in finding out more, want to submit an article or a news story, or just want to discuss the challenges around the family business sector, please do not hesitate to get in touch.